Condor Cases provide protective mixer flight cases for many hire companies which because the nature of there business a high level of protection is needed for the mixer units, these cases tend to be transport only flight cases and usually consist of corner foam blocks or CAD designed foam routed profiles to match the shape of the mixer, this gives a good amount of shock resistance to flight cases that are transported from place to place more than most. 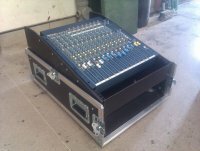 Condor Cases also provide custom built mixer cases, DJ equipment cases, broadcast equipment cases and audio visual cases; where the mixer will be used within the case this can be achieved in a number of ways. 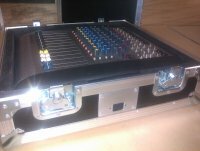 Top Hat: This is a flight case where the base is very shallow with minimum contact to the mixer and the larger lid containing the majority of the supporting foam, once at your venue just remove the lid and you have all the space around the mixer to connect your cables. Rack Mounted: If your mixer comes or can be fitted with rack ears then these flight cases are for you, the rackstrip can be fitted to the flight case flat or at a preferred angle to suit you or a tilting rack frame can be fitted so the angle of the mixer can be changed at any time, these cases can be constructed with multiple lids and fitted with IEC.